Keep your treasured companion happy and healthy when you schedule a house call with our holistic veterinarian in Conifer, CO. Aspen Park Vet Hospital is your local source for quality care throughout the area. From natural remedies to animal acupuncture, we offer a series of house call vet services for your pets. We work hard to use the science of animal behavior to help horses, dogs, cats, and koi fish live healthier and happier lives. Schedule an at-home appointment today to discuss treatment for your pet. When your furry friend is under the weather, loading him or her into the car can add unnecessary stress. Keep your pet healthy without leaving home when you turn to us for house call vet services. We are happy to perform mobile vet services for each of your needs. Dr. Jena Questen is a compassionate veterinarian who combines traditional and holistic veterinary medicine, including acupuncture, with the science of animal behavior to help cats, dogs, koi fish, and horses recover without the need for a trip to the vet. Our practice focuses on house calls in order to provide every critter with the leading standard of care. 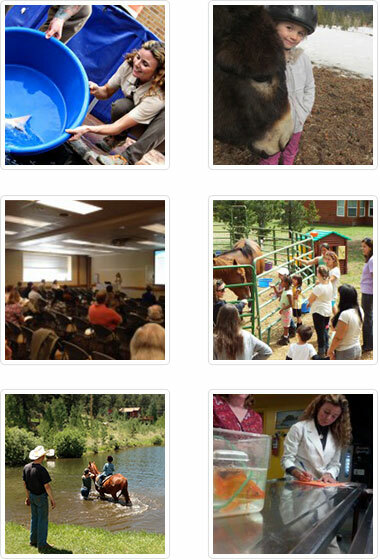 We promote the health and longevity of all animals at Aspen Park Vet Hospital through the emotional connection between animals and their people, using compassionate traditional and holistic veterinary medicine, as well as unique, advanced interpretation of animal behavior and training. Animal acupuncture can be used to alleviate chronic pain and help with common behavioral issues. This natural remedy is an ideal solution for pet owners who do not want to subject their beloved companions to harmful medications. Dr. Q, aka Dr. Koi, has been caring for pet fish in Denver since 2005. She is a well-respected holistic veterinarian and lecturer on fish health and has been featured on the news and in national magazines. Dr. Q is the only vet in Colorado who routinely diagnoses, treats, and performs surgery on fish. In 2014, she became the 21st person in the world to achieve the CertAqV designation for work in aquatic animal medicine by the World Aquatic Veterinary Medical Association. As an aquatic vet, her unique approach to animal wellness is used by pet owners to improve the relationship between themselves and the animals they love. Dr. Q’s goal is to provide balanced traditional and alternative medicine for her patients. Contact us in Conifer, Colorado, to request assistance from our holistic veterinarian. We offer house call vet services for animals throughout Central Colorado, including areas from Aurora to Bailey. If you'd like to see your review on our website, please feel free to email us!